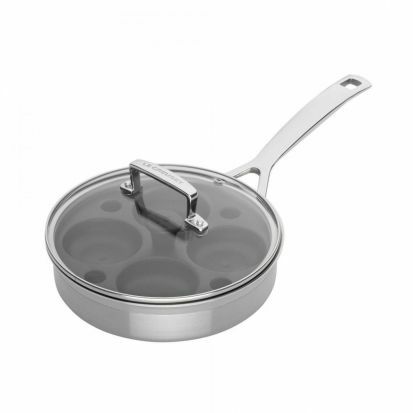 It can, of course, be used for sauteing or shallow frying; it can also be used in the oven for baking and roasting; it can even be used to cook stews and casseroles in small portions using the glass lid; and finally, thanks to the non-stick insert, you can enjoy delicious poached eggs too! Its compact size makes it ideal for couples or small households, as does its versatility. The clever 3-ply technology is designed to give even heat spread throughout the pan, and it can be used on all heat sources, including induction. It is oven safe and dishwasher safe - although be sure to check the product details for a full care guide when purchasing for all the details and maximum temperatures.